A bakery but not as you know it. Happy Pretzel's brings a continental flavour to Reading – and it's freakin' yum. Having stuffed my face in the finest dining rooms in Berkshire, I want to reassure you that I’m more than capable of keeping it real. 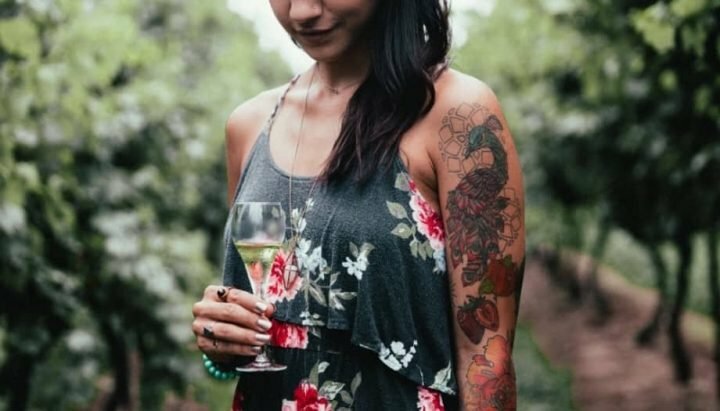 There are times when you simply don’t have the time, money, or waistline to sit through two or more courses. When you’re juggling kids, work, life in general, sometimes you just need to grab and go. 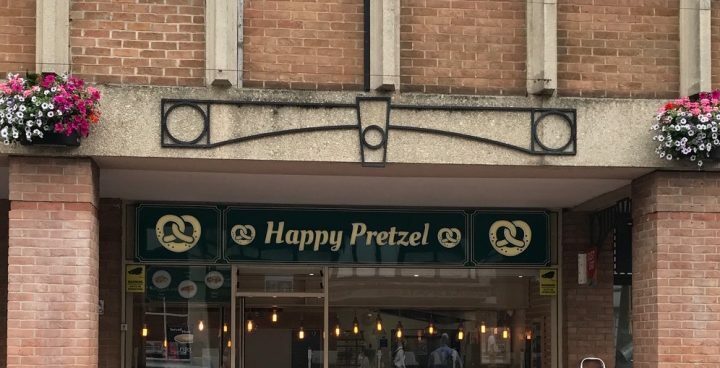 So it was great to stumble across the brilliant Happy Pretzel in Reading. It’s a family-run bakery that’s only been open a few months and serves the most delicious, freshly baked soft pretzels, bagels and pizzas. 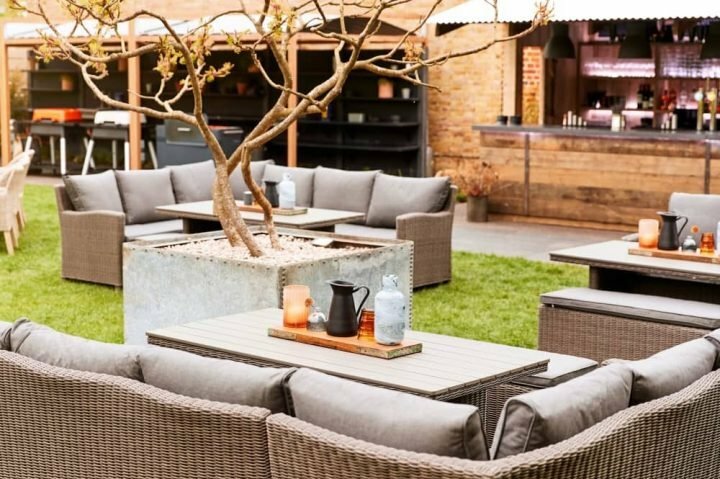 You’ll find it in Market Place, an area of Reading that has been a little unloved in recent times, but – and there is a big BUT – it’s fast becoming a food quarter with more independents and small chains like The Botanist popping up at this end of town. Warm, friendly, sociable and with some nice design touches – Scandi lighting and modern panelling and metro tiles. 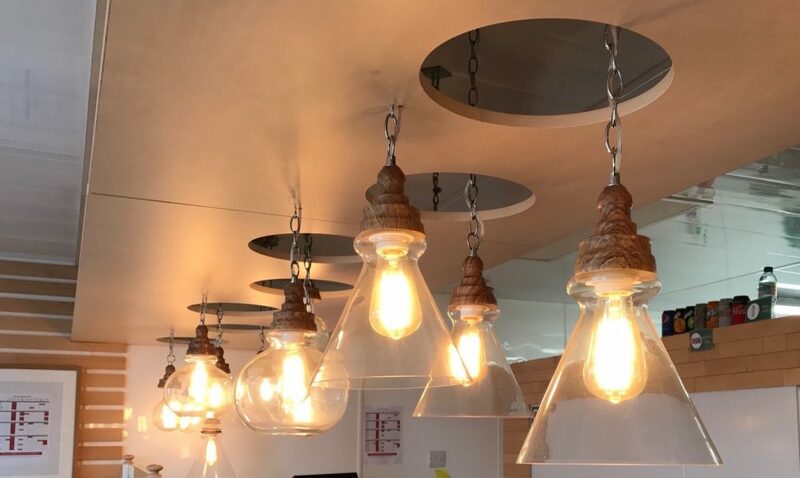 I’m loving these wood and glass pendants with Edison lightbulbs. There is a modern yet functional vibe to Happy Pretzel. The decor invites you in, but the food is very much the star of the show. Although it is more of a takeaway than a place to eat-in, there are a couple of contemporary bar stools at either end of the shop for you to perch, have a bite and read a magazine. 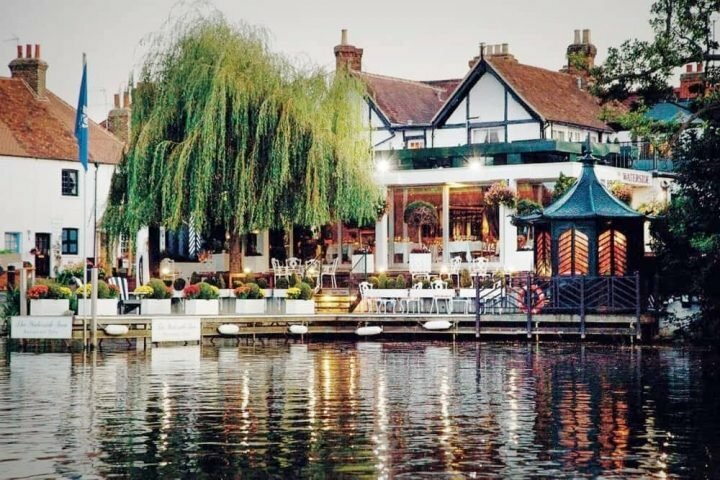 But with the pretty Forbury Gardens around the corner and the River Kennet within striking distance, there are some tranquil places to take a load off while you tuck into your breakfast or lunch. Ain’t no quaffing (of the boozy variety anyway), it’s all about the scoffing. Happy Pretzel is a relatively small space and a lot of it is dedicated to the ovens. This is the price you pay for super fresh baked goods. But a lot of love goes into the menu. 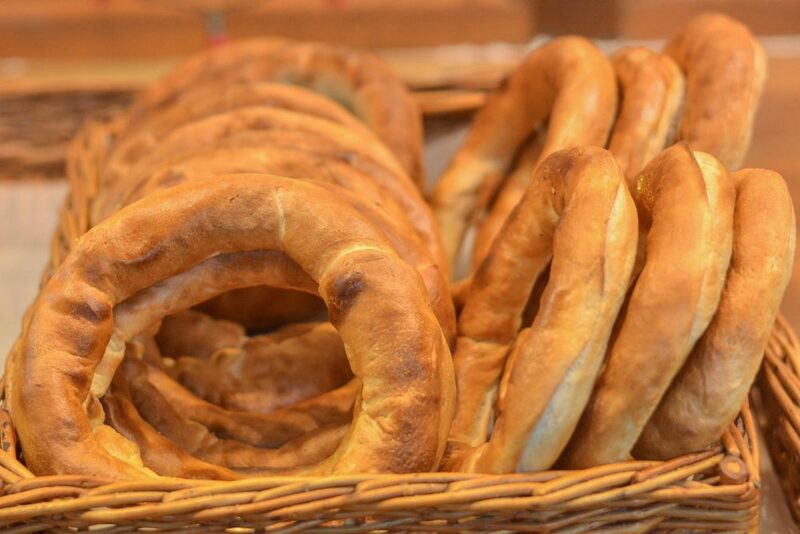 Owner Catalin is Romanian and has brought a slice of home to the UK with a variety of sweet and savoury soft pretzels, bagels and pizzas – perfect for picnics and pitstops while you’re mooching or working in Reading. Greggs, this is not. It’s like the amazing bakeries you discover on holiday that draw you in like the Bisto kid. The devil is in the detail and the flavour options have been well considered to suit all tastes. The mozzarella stuffed pretzel dog with poppy seeds is mouth-wateringly good. The poppy seeds elevating it from nice to nom nom nom. If a snack could represent Brexit limbo, the cheese and marmite pretzel dog would be it. This flavour combo has been specifically made for British customers encased in the lighter than light Romanian pretzel dough. Catalin assures me you will NEVER see Marmite in Romania because it is universally hated. Personally, I could bathe in the stuff. It’s a Romanian-British mash up, and long may it continue. I’m going to put my neck on the block and say the is the only place in Reading that sells pizza by the slice. There, I’ve said it. Shoot me down in flames if I’m wrong. At £1.70 a slice, it’s fantastically priced. I tried the Carbonara. 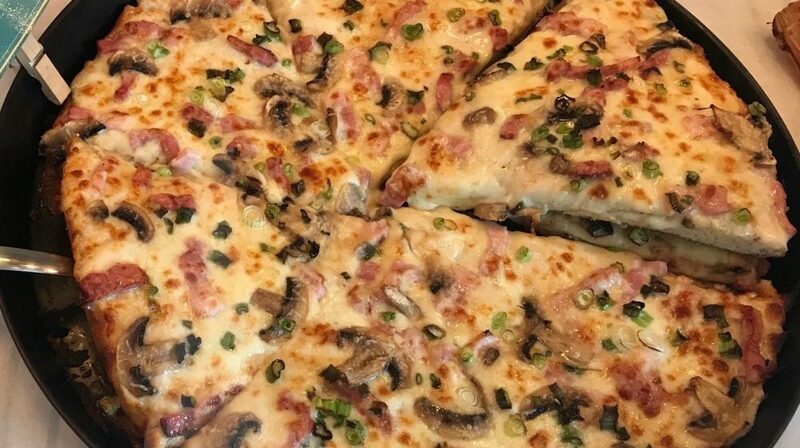 Instead of a tomato base, a carbonara sauce is used on the same dough used for the pretzels and bagels and topped with mozzarella, bacon, spring onions and mushrooms. I cannot recommend this enough. It was one of the most delicious pizzas I have EVER tasted. No stodginess either – surprisingly, no elasticated pants were required for this trip. Fancy something sweet, they cover that too. The bagels are stuffed with different jams, chocolate, caramel. You name it, they pretty much have something to scratch that sugary itch. If you’re on a no carbs before Marbs, Happy Pretzel will test your willpower to the limit. But for a bread lover, like me, I’m as happy as a piggy in the proverbial. Hell yes! I don’t think it gets more kid-friendly than this. In fact, it’s a place I would make a beeline for with my boys as an affordable lunch stop serving fresh food. Prices start at £1 and they offer free coffee in the mornings when you spend just £2. The pizzas are an absolute winner and the pretzel dogs would hit the spot. None the food on offer is swimming in oil so it’s actually pretty healthy too. OK, so it’s not a salad, but they use quality ingredients and the dough is light, so don’t fear the dreaded bloat. It’s proximity to the shops in Reading make it a great place to get food down little ones when hunger strikes. 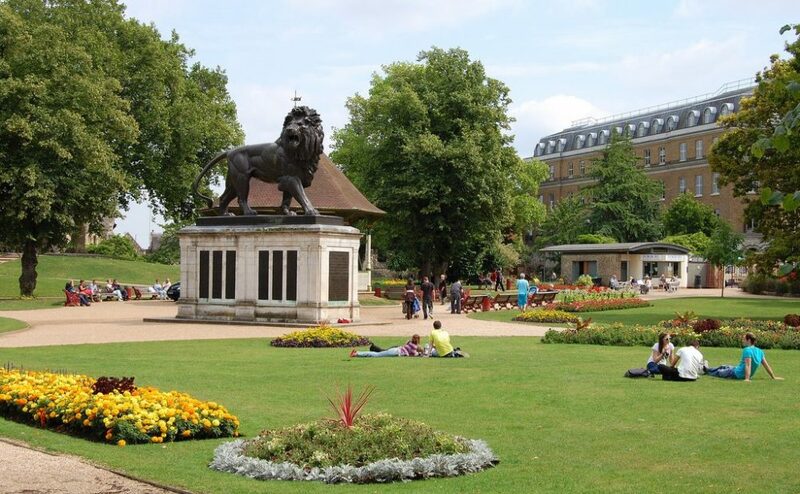 But I’d recommend, grabbing your food on a sunny day and heading to Forbury Gardens. It’s reminds me so much of London parks – children playing, people sunbathing, reading books and enjoying picnics. No events just yet, but watch this space. The street food feastival in Forbury Gardens is becoming a big draw and Happy Pretzel could pop up there in time. If you live in the Reading area, you can also order online. There’s a minimum £15 order plus a £1 delivery charge. I mean does it get better than that. Opening hours: Mon-Fri 10am-7pm; Saturday 10am-6pm; Sunday closed.